I wasn't expecting an Earth-shattering Eisner winning comic with the Grumpy Cat / Garfield crossover. To be honest, I wasn't even sure it really fit the definition of crossover as until then I didn't even know there had been comics based on the internet-famous meme cat and I so I was thinking it was more of a cameo-type deal. It turns out there is a Grumpy Cat comic strip. It also turns out that it's not half bad. No, it won't win awards but for the younger folks, I'll bet they'll be entertained. As for this older folk, I was interested in seeing how Mark Evanier would extend Jim Davis's creation, Garfield, into a full length story versus the usual three panel strips. I was also looking forward in seeing how he'd manipulate the plot to bring the two characters together in the first place. Finally, I wanted a chance to see how they'd interact, how their personalities would work together (or not). Extending Garfield to a full length story didn't appear to be a huge challenge for Evanier. He had enough gags throughout to keep the punchlines more or less three panels apart while not losing sight of the larger arc involving an evil pet company who have kidnapped the titular cats. On that note, the meet-up assumes that Garfield and Grumpy Cat actually inhabit the same world. They've been selected as victims based upon their sour personalities as the company has a new device that they need to test on them. The device will hopefully transform them into being more loyal and lovable, more like dogs. The idea is that if it can work on these two it will work on any cat. So again, it's a pretty juvenile concept but to be honest, superhero crossovers always resort to multiple-universe collisions and at least this has a bit more originality. As for the personalities working together, that's probably the weakest part of the book. It seems like Evanier took more time to learn Garfield. He comes across very much as the cat from Jim Davis's strips and as such he's a bit more defined. Grumpy Cat on the other hand is just, well, grumpy. Not being as familiar with that character, I might suppose that he's just that great of a character. In any event, it's hard to generate much interest in the usual crossover constructs (1. they don't get along at first and 2. then they are forced to worked together and appreciate one another more) especially when a half of the equation is pretty flat. The art is bright and not bad, though a bit inconsistent. 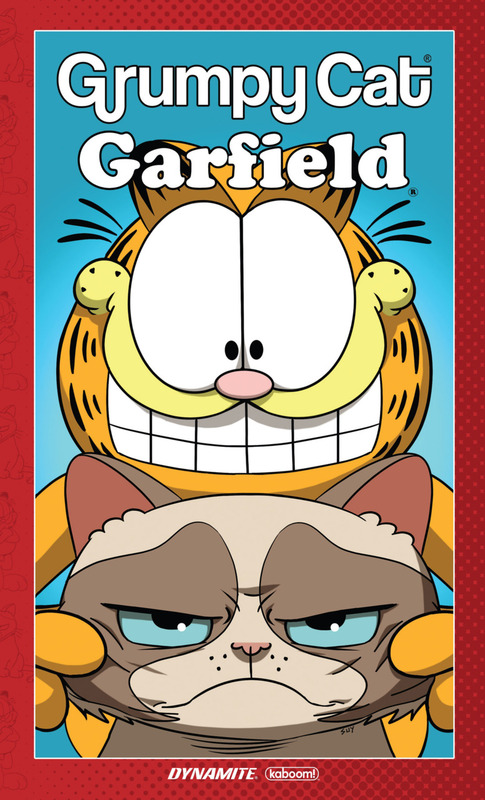 Garfield and Grumpy Cat look different but as they're based upon their original comic characters that's fine. But the human characters have yet a third style, similar to manga characters, and I'm not sure it all blends that well. Still, it's all a fun diversion if not perfect.